A simple shot of a not so simple scene. There are a lot of superlatives associated with this place, but on this particular morning - the first day of the year - the most relevant one for me was the ungodly hour at which I had to get up: 3 AM. However, the early driving towards and up the 3 kilometer tall volcano through rain and mist in the dark was all worth it once I made it to the summit. 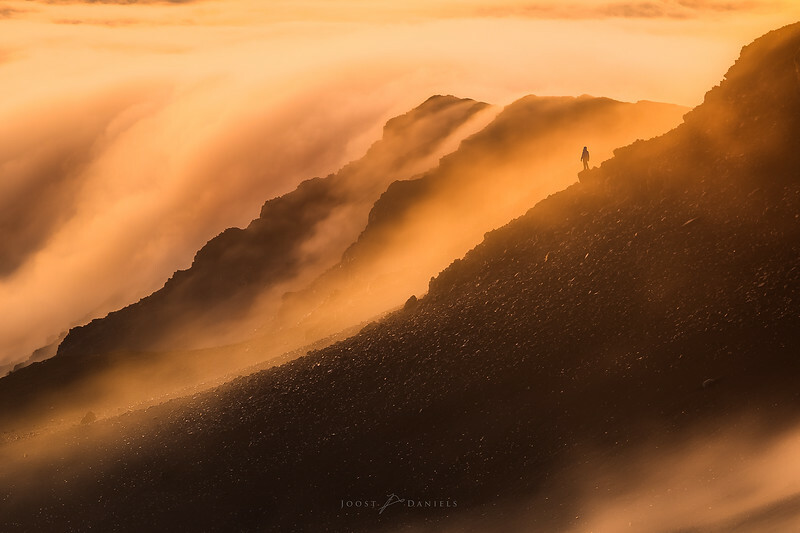 I got there well before sunrise and was shrouded in dense fog, soaking my coat and backpack. Once the sun rose, it burnt off just enough of the fog to see it stream it into the caldera from the windward side of the mountain. With the golden rays it created this surreal scene and I couldn’t think of anything better to do than just focus on the light. Single image, minimal processing. Part of a massive panorama which I will post on my website sometime soon. From the many mountain and coast shots I have up on this website, it may not be obvious that I've also spent a fair amount of time taking pictures underwater! Having recently purchased an underwater housing for my trusty old 7D, I felt it's time to share a shot from below the surface. Below water AND land in this case, at a dive site where the name reminds every diver of the hazards of entering any cave structure. 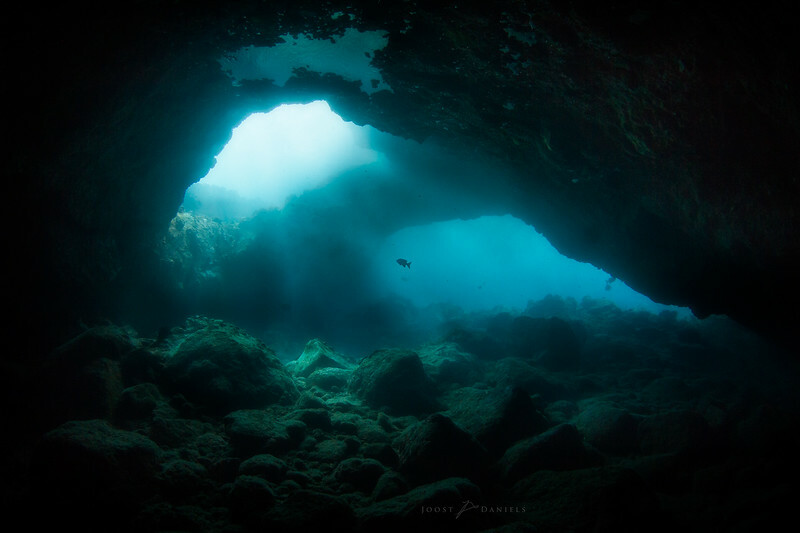 With surf breaking overhead, strong surge and a decent current through this cave it was certainly not for novice divers, but these conditions did make for some pretty dramatic lighting! In March we went on a week-long trip to Hawaii. With much better water conditions than last time, we got a lot of diving in, and even made an exciting side trip from our base on Maui to the Kona coast, where we got to dive with manta rays! Anyway, during our stay on Maui we found ourselves skipping certain activities simply because they were things we could do in our home town! For example whale watching etcetera. We realized how lucky we are to live along the Monterey Bay, with some amazing opportunities for wildlife and landscape viewing, as well as good weather. During the rainy days we joked several times how the weather on Hawaii was a little too 'tropical' for us Californians! Anyway, on the one evening we did get good sunset conditions I got this shot in, handheld, after rushing to the beach when the weather suddenly improved. Yup, that's the name of this manta ray. Sorry, mobula ray. Following recent genetic research, manta rays, previously belonging to the genus Manta, were reclassified to the genus Mobula, or devil rays. With their strong similarities to other species in that genus, this is certainly not a surprise to many, but does that mean we should start calling the two ex-manta species mobulas, too? As for this shot, it was taken off the coast of Hawaii, at a location where mantas are known to gather at night to feed on plankton. 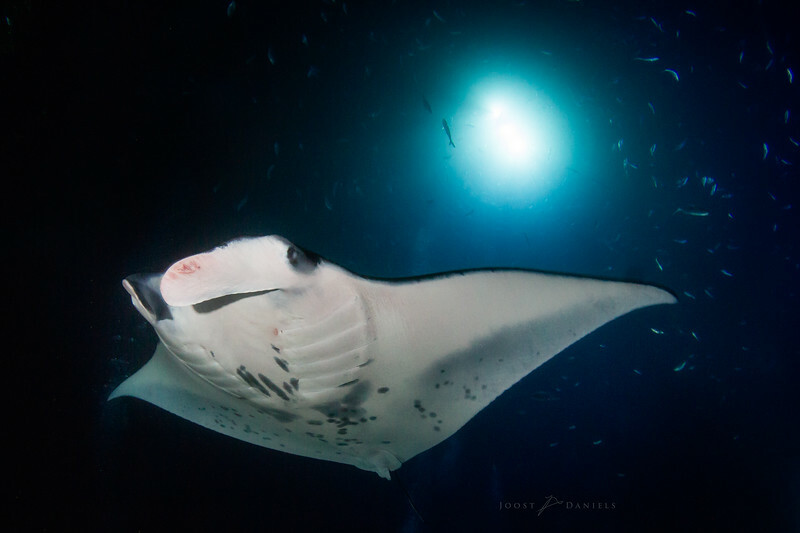 In this particular site, an interesting symbiosis between divers and mantas takes place: the dive lights attract plankton, and the rays know this makes for easy snacking. In return, divers are often treated to close encounters, and I'll go as far as to say that it was one of the most amazing experiences I've ever had. Pictures simply don't do it justice, but I wanted to share one nonetheless. This particular manta, a male named Captain Mike, has been frequenting the site since 2008, and can be recognized by the unique pattern of spots on the ventral side, and a crooked tail. This location had been on my list for a long, long time. Despite passing it several times in the past year, and it being a relatively short hike from the highway, only on Christmas Day 2017 did I get a chance to make it up there when the weather forecast was promising. After a nightly slog up the hill and a chilly, short night in the tent, this view of not just one, but four volcanoes revealed itself to me. I was the first one up there in a few days, so I got to witness the pristine snow that had fallen during my hike up. A beautiful sight. I wrote a short blog post about this trip for the website of travel guide writer Angela Heetvelt. Warning: it's in Dutch! Practice makes perfect. Since moving to the Monterey area, I make a point of comparing weather forecasts to actual conditions to get an idea of what forecasts and what conditions can precede excellent photographic opportunities. This time, I expected a good sky if we got a partially clouded sky after some rain. And while the forecast predicted clear skies, I noticed some clouds building during the day and decide to take my chances. 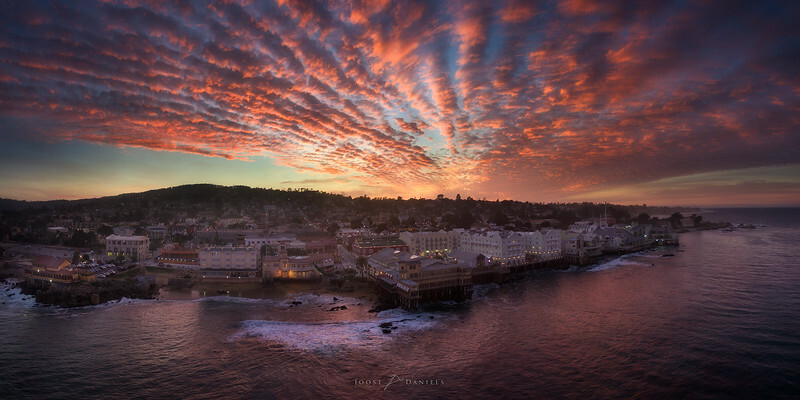 Sure enough, a beautiful sunset burn lit up the Cannery Row waterline. Can you spot the Monterey Bay Aquarium? To me, this picture is about how things don't always go as planned. About effort and reward. About having to adapt, and making things work with whatever you're given. 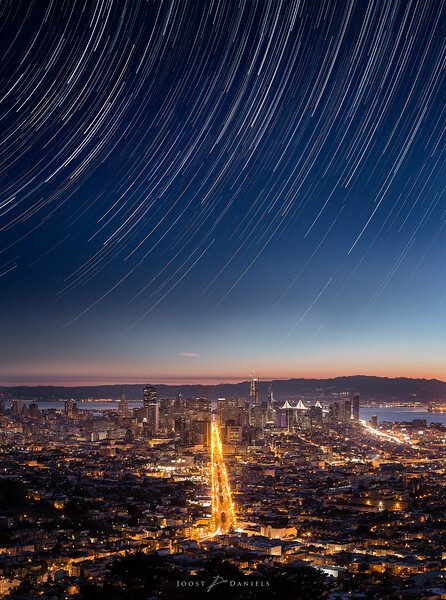 With about a million photographers living in the San Francisco Bay Area (or so it seems), it can be challenging to get a unique perspective. While I will not claim this is a unique vantage point, it is definitely something I have not seen very much, and I've never run into any other photographers in this spot. This is actually a reprocessed version of a shot from 2014. From my original post: For some reason when getting up to photograph sunrise always ends up in a race against the light. Even if I get up on time and I am well prepared, I usually end up running the last few minutes. In this case it turned out that some trees were blocking part of my view from the location I picked, something I did not remember from the many times I had been to this spot. So there I was, running along the trail and up hills, ignoring the spooked coyote on my path, to try and make it in time for blue hour. Arriving a bit late for the real balanced light I still managed to catch the various colors before sunrise, racing across the sky. 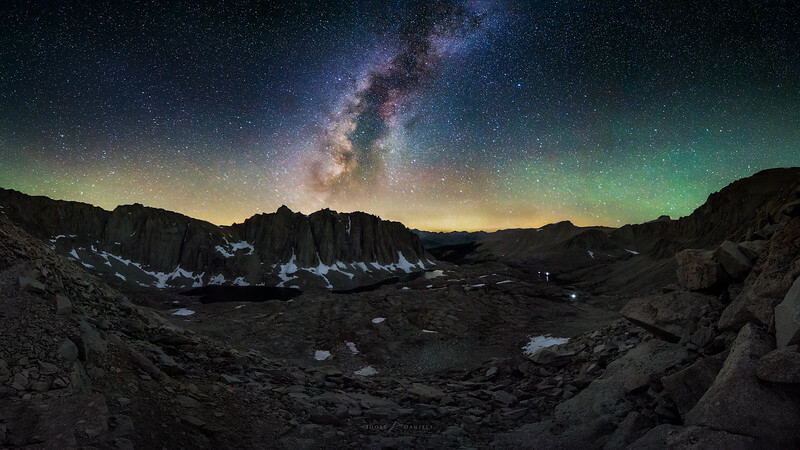 The beginning of the end: a shot from a nightly ascent of Mount Whitney, the highest point of a Sierra Nevada through-hike, and also the highest point of the contiguous US for that matter. The colors on the horizon are from air glow, fire and even city lights over 100 miles away. The summit of Whitney is just out of the frame on the right, and you can see the lights of some of the other hikers starting to get ready for their ascent at the lower elevations. It was quite the adventure getting to this spot, and I'm glad to have this image to remember it by. 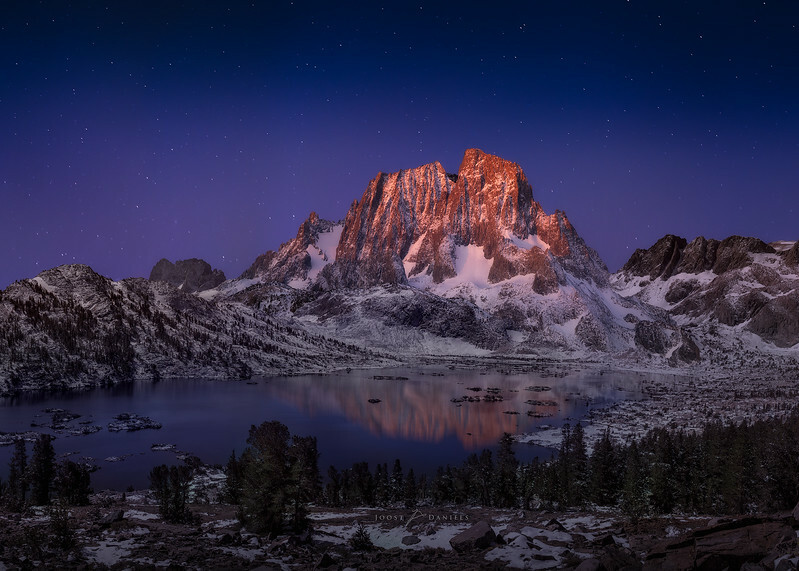 This picture was taken on a fun adventure where we roamed the relatively unknown Dinkey Lakes Wilderness at the middle elevations of California's Sierra Nevada. We underestimated the driving time to get there a bit, so we ended up driving through a large part of the night before starting our backpacking trip the next morning. It was late in the season (mid-November), and we weren't sure in advance if the road would still be accessible all the way. Combined with the remote location, and the relatively unknown area, we had the entire place to ourselves and didn't see a human soul on the entire trip. Hiking in 7 miles or so, we fell asleep in the sunshine by a little lake, and I almost missed the sunset! 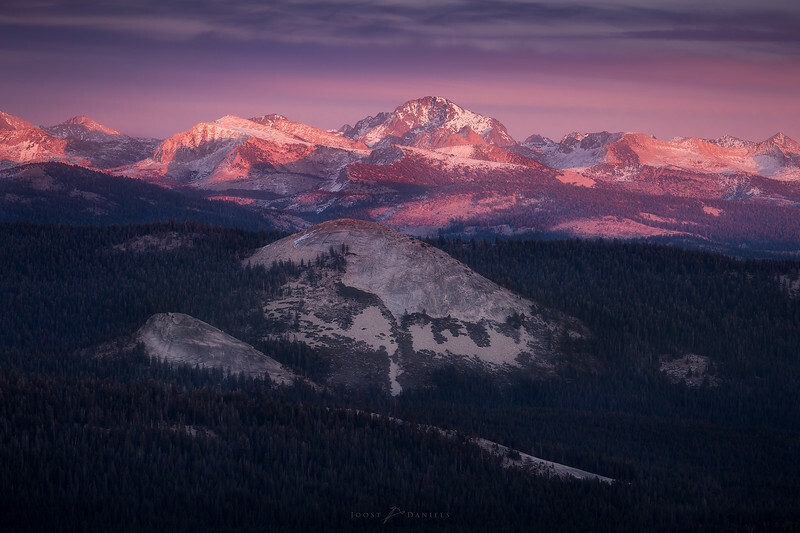 Shortly after setting up camp I ran to the edge of the large plateau we were on, to witness one of the widest, most impressive views of the Sierra I have ever seen, combined with these gorgeous sunset colors and rising supermoon. 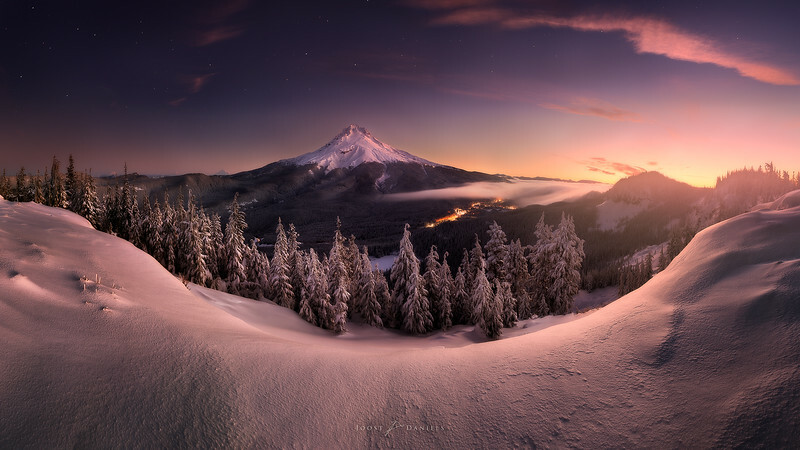 Centered in the image is Mt. Goddard, standing 13568 feet (4136 meter) tall, but in the full panorama I could see all the way down to Whitney! It's no secret that as humans we have a major impact on the earth and have colonized a major part of it. Fortunately, this realization has prompted a lot of conservation efforts in the past decades, proving that with a little help and some well-informed management, our world's natural systems are amazingly resilient. 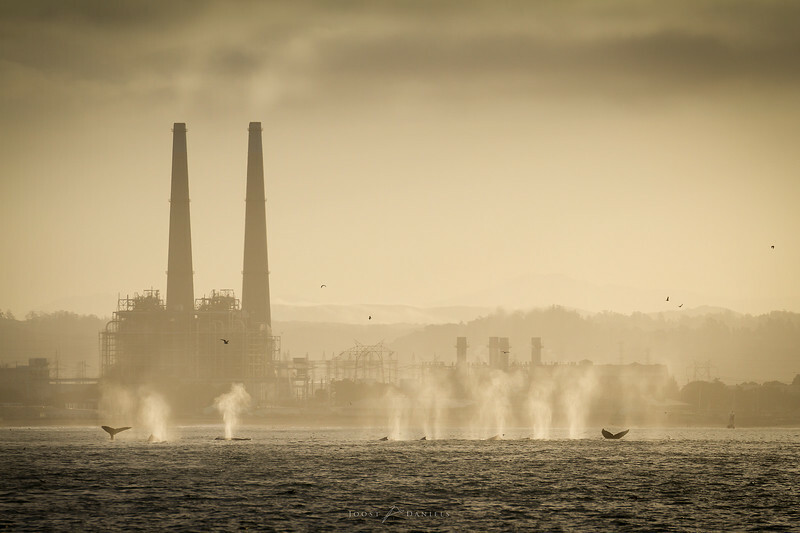 Here you can see a group of humpback whales working together to feed on dense schools of bait fish gathered together above the Monterey Submarine Canyon, right in front of the Moss Landing power plant. If done carefully man and nature can coexist! In the middle of the desert there is this large rock with petroglyphs, apparently some 5000 years old. 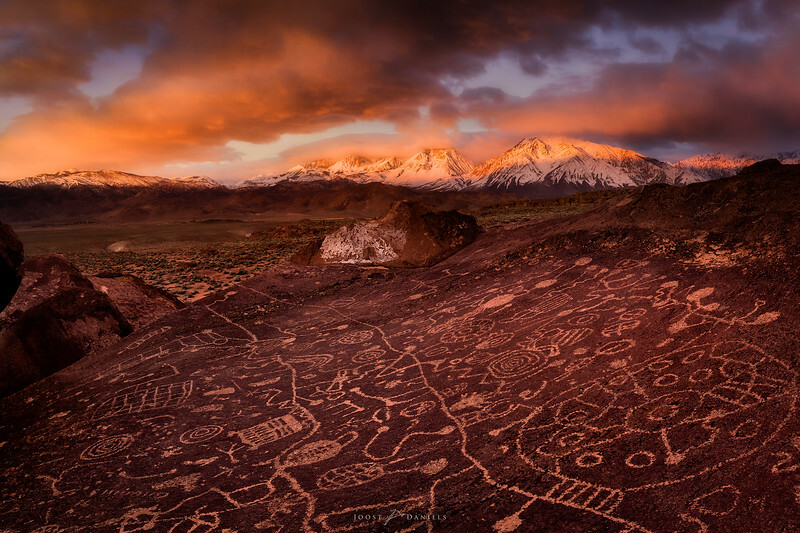 The figures and shapes that are carved in the rock seemed extra special when I got to this site in the dark, and the Sierra Nevada mountains slowly started to light up in the sunrise light. 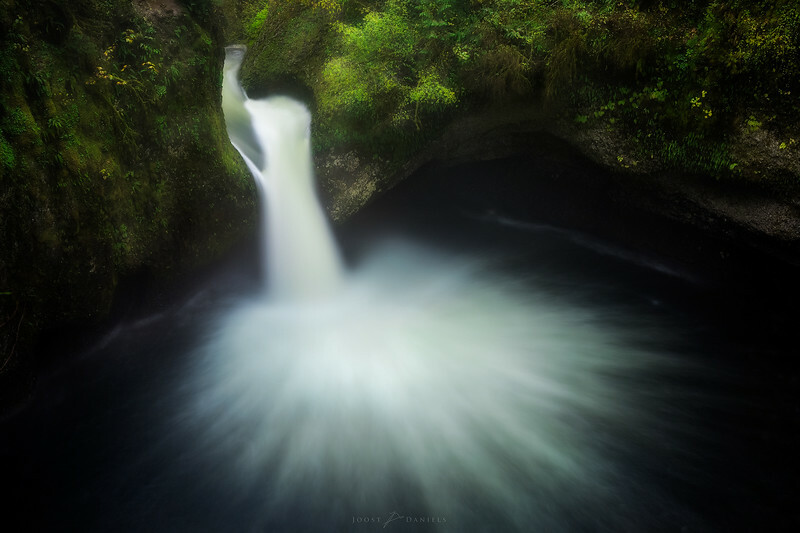 Just another beautiful waterfall in northern Oregon. This is a popular spot, but I was here all alone, thanks to the late October chill and pouring rain. On the walk back, parts of the trail that I walked on earlier had eroded away, creating small mudslides down the steep slopes into the river. I was glad when I made it to the car! Can you see the waterfall? A lush green forest in summer, but a harsh, icy setting in winter. 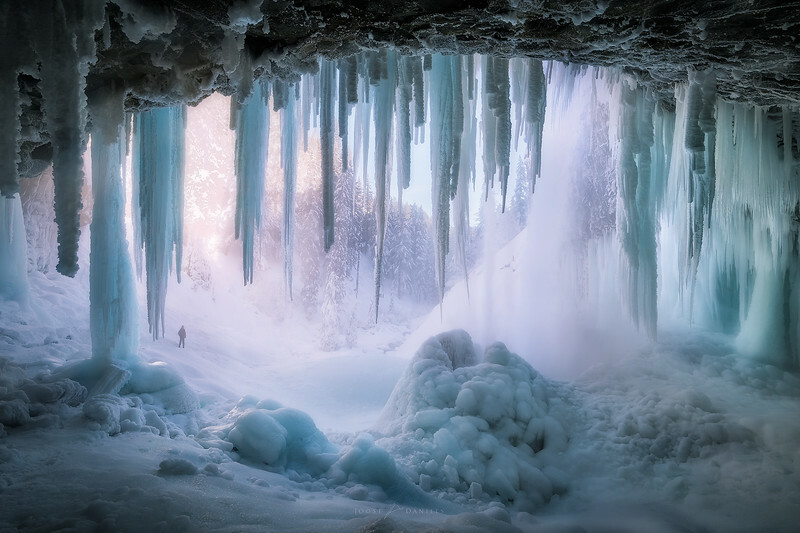 Enormous icicles had formed behind and around the waterfall, where freezing droplets from the spray combine to form massive structures. In just a few seconds my camera gear was frozen over so I acted quickly to get this final shot of the morning. After that I spent a while scraping the ice of my lens; my tripod did not collapse anymore until two hours later in the car. Big thanks to my friend Doug who is modeling for scale here. 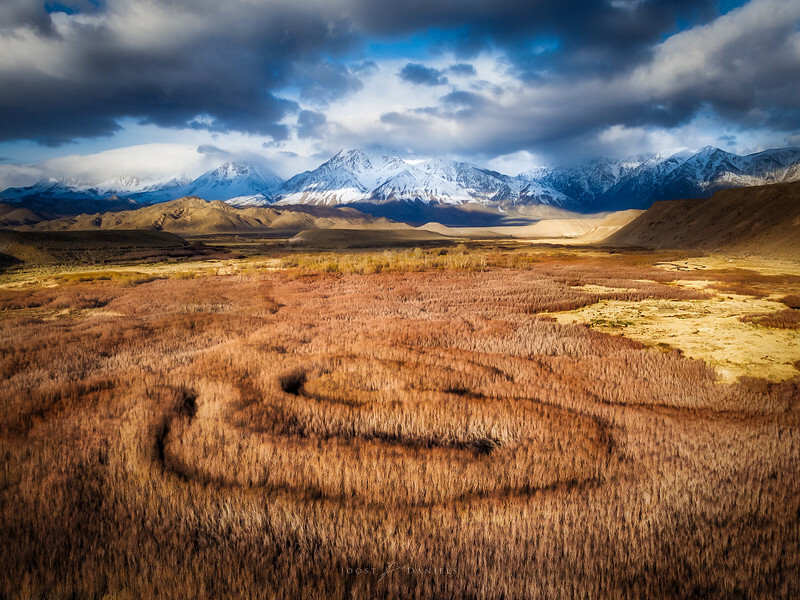 This photograph was taken from a spot just a few hundred feet below the summit of Mt. Agassiz (4236m) in the Sierra Nevada. I admit I did not make it to the summit to bag that peak on this day; I did not want to miss my opportunity for sunset shots so I had to stop the ascent. I was also becoming quite dehydrated, the result of me carrying less water in an effort to reduce pack weight. I managed to pass by the lake in the center of the frame without seeing it, to my regret. Being so high up (Agassiz belongs to the 20 highest peaks in California), the sense of scale is easily lost. View this image full screen and see if you can find the yellow tent by the lake's edge. To a photographer, often the most memorable things about a photograph are invisible in the shot itself. 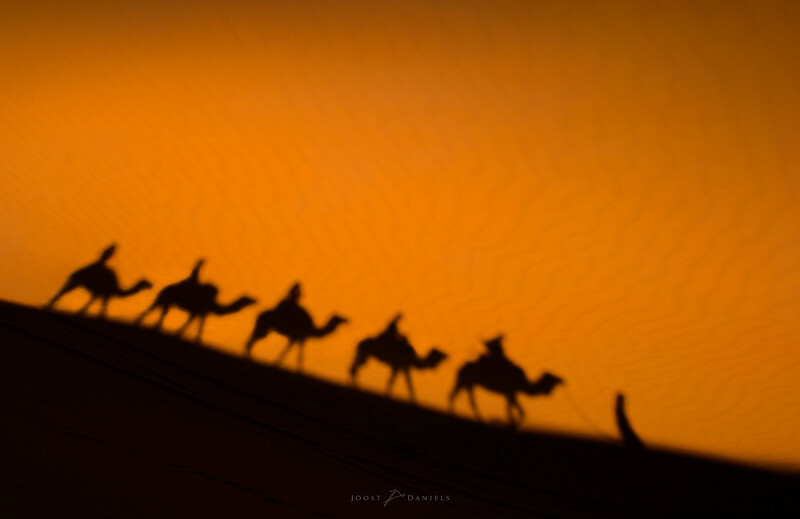 In this case, that element was the howling wind blowing dust and salt across the desert. We spent almost all the time I had planned for scouting the area trying to find a spot we could anchor our tent with a chance of getting sleep. Worse yet, we brought meals that required a fire to prevent contracting Salmonella. In the end we parked our tent between these large rocks on the leeward side of these big boulders, and our fire in a crack in a nearby rock. Exploring the ridges in the dark was interesting to say the least, but the sky was surprisingly clear despite the dust storms we had witnessed earlier. Anyway, here is a picture of our campsite, just as a tiny crescent moon started to rise, illuminating the foreground a little bit. Let me know what you think! 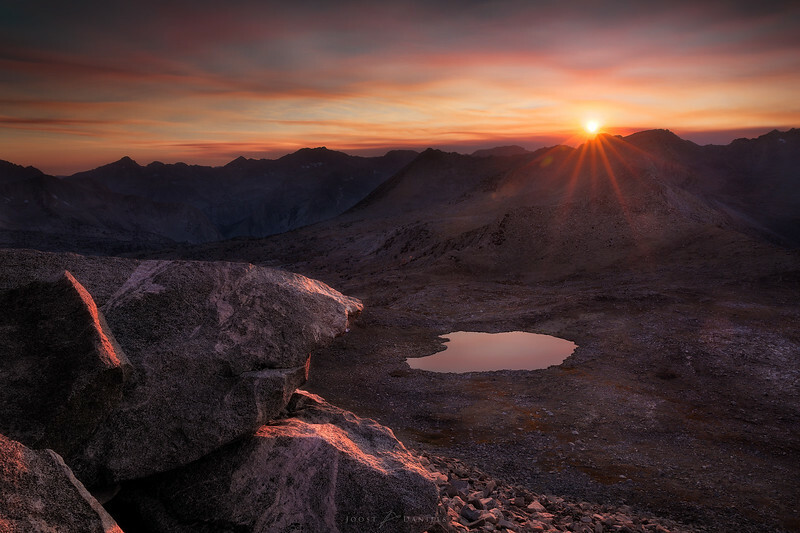 There is no such thing as a bad day around the Sierra Nevada. Here is a morning view of the Owens River (too flooded to get the classic close up shot of the river) after enjoying one of those magical Sierra sunrises up on the bluff. Shortly after we were warming up in one of the nearby hot springs. They say that for every surfer taken by the waves in this spot, there is a peacock at the neighboring ranch. The eerie sound of the birds on the walk out makes you understand where that rumor (fact?) comes from. On this evening the water was particularly calm, allowing me to take this shot from a somewhat unusual angle. 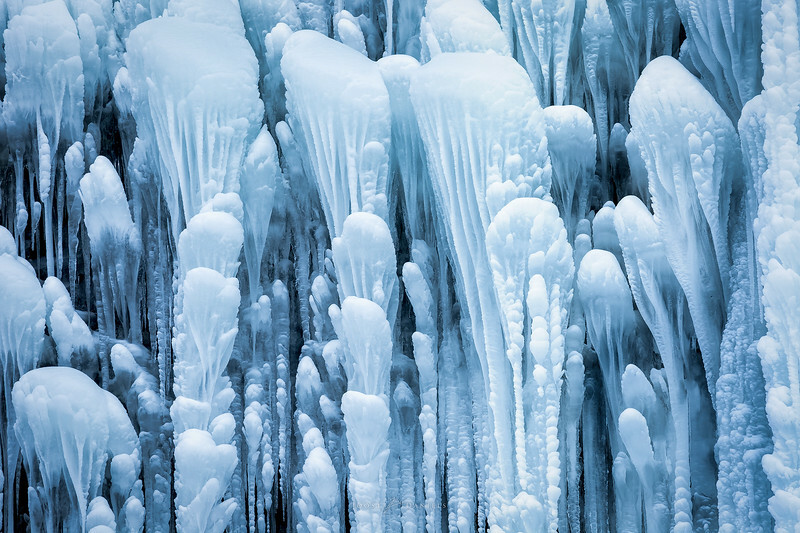 A detail shot of a large frozen waterfall. To give you a sense of sense of scale, the horizontal extent of this frame is about 4 feet (1.2 m) wide. Right next to it was the rushing water of the waterfall, the spray from which deposits enough freezing droplets to cause the growth of some very interesting structures on the rock wall. 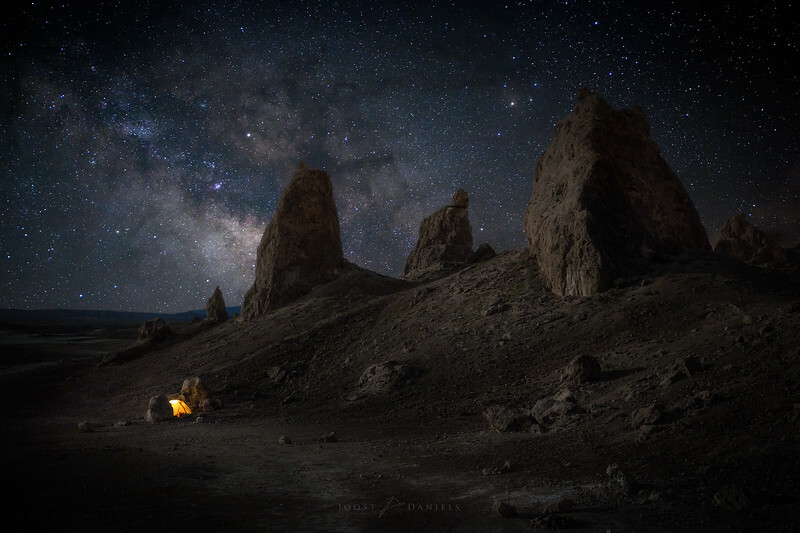 In the middle of the Mojave desert, these mysterious pinnacles rise up from a salty dry lakebed. 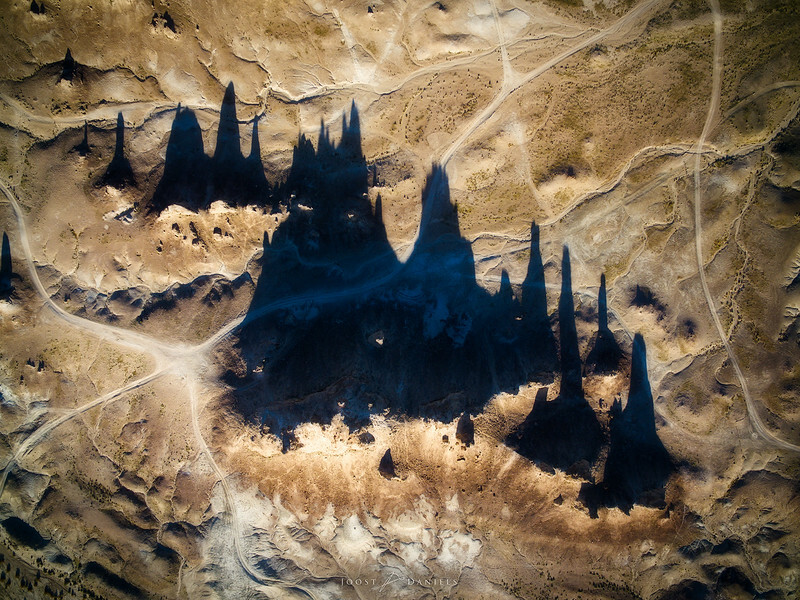 At sunrise they create dramatic shadows on the surrounding landscape. A unique photograph; this is something I haven't seen anywhere else on the web! 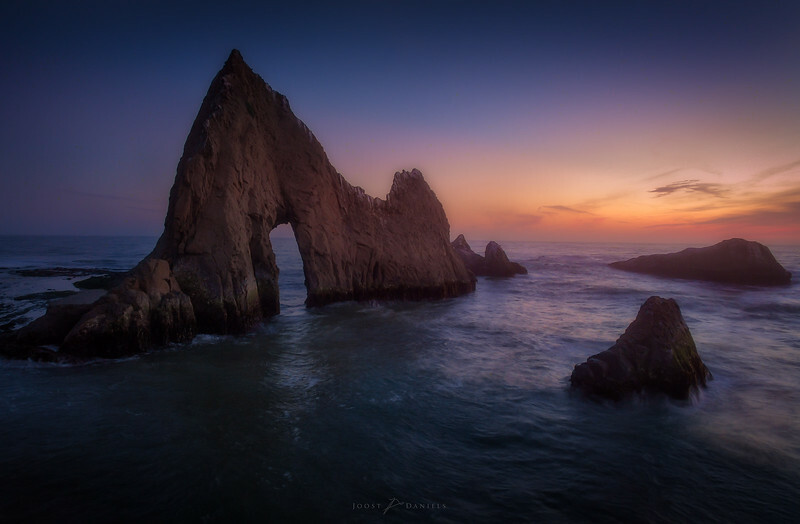 On a very clear, cold and dark night in San Francisco I headed out to this spot which at the time required a walk of a few miles. My intention was to shoot a star trail image, but my camera picked up the milky way, so I had to focus on that. 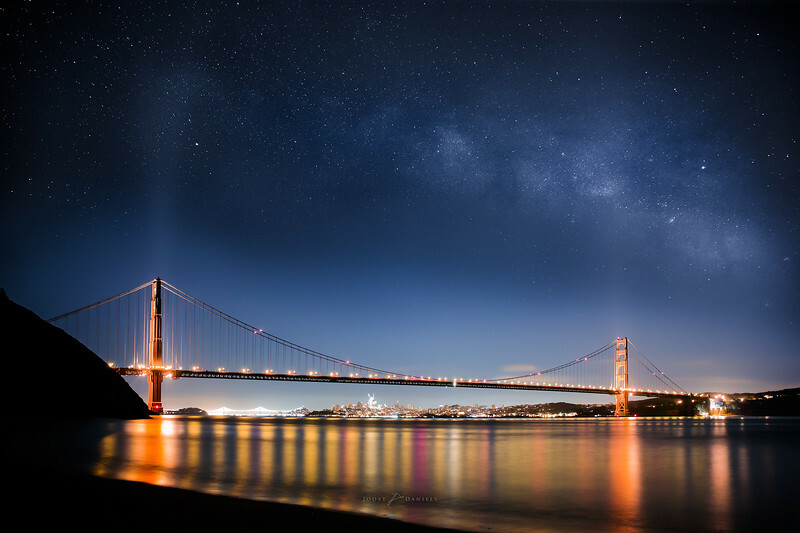 Before heading out, I was vaguely aware of the milky way orientation from this viewpoint and had hoped to catch a glimpse, but never thought I'd see the milky way this clearly over a light-polluted place like San Francisco! I can only think this is fairly rare as this was an unusually clear winter night. It appears that some of the light pollution is captured by the humid layer over the city, shielding the clearer, higher elevation skies. Stormy weather along the coast made for some epic waves near Monterey, California in the El Niño winter of 2016-2017. 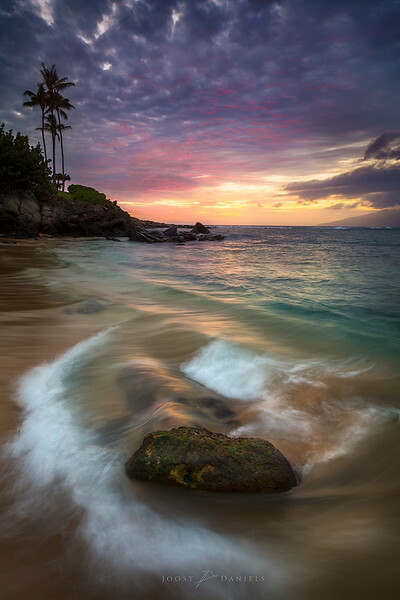 While some lone waves crashed dramatically over the rocks, at times these large sets would come in and create amazingly tumultuous waters in an area that is typically much milder in appearance. Vast stretches of desert in east California currently display these bright splashes of color, caused primarily by a flowering plant called "Wallace's woolly daisy". 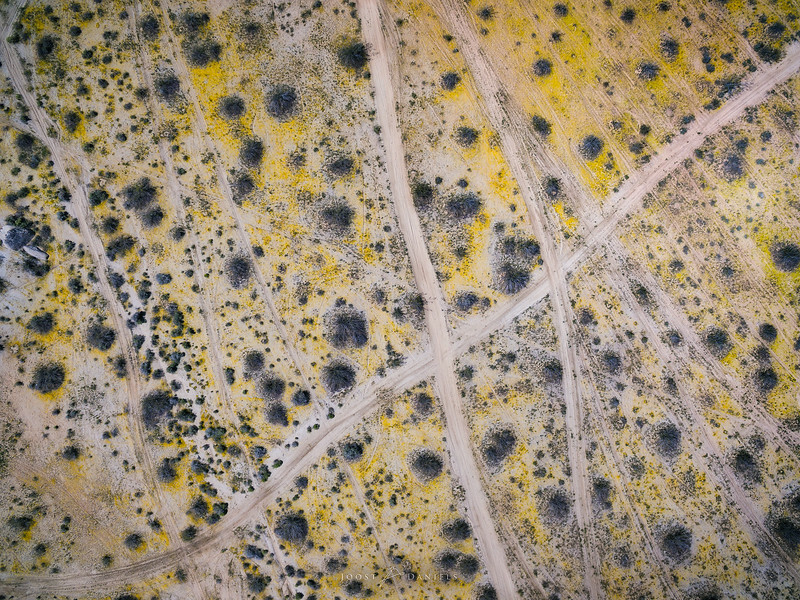 The pattern are tracks of off-road vehicles. 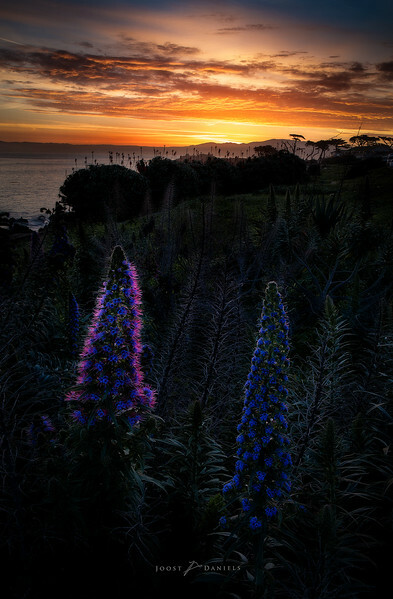 Sunrise skies on the California coast illuminate yet another beautiful but invasive flower. From a beautifully clear late night / early morning in San Francisco, looking straight down famous Market Street. It is rare to see stars this well in such a light-polluted area, but when some unusually cold temperatures passed through the region during a new moon, I seized the opportunity. Towards the end of the 2 hour exposure, the sun started to paint the horizon and the city started to wake up. 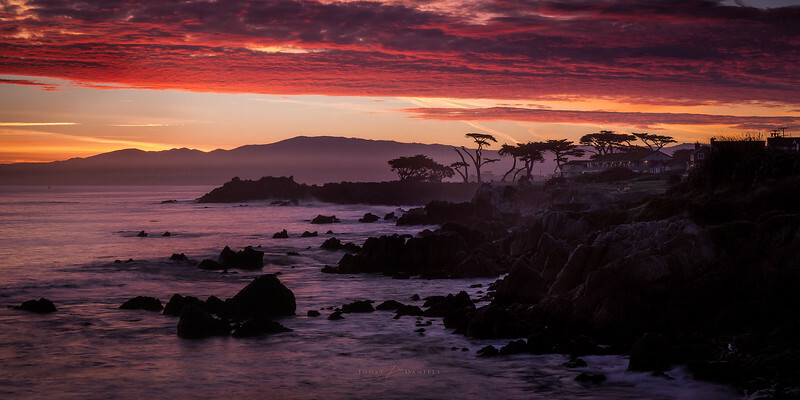 Moments before sunrise in Pacific Grove, California.